The State Board of Education is considering creating standards for an official Mexican-American studies course after two failed attempts to approve a textbook for the subject. The State Board of Education is considering creating standards for an official Mexican-American studies high school course after two failed attempts to approve a textbook for the subject. Advocates, including many professors and teachers, urged the board Tuesday to set coherent curriculum and graduation requirements for a course they said is already being taught to hundreds of students across the state and that is important for the state's majority-Hispanic student body. 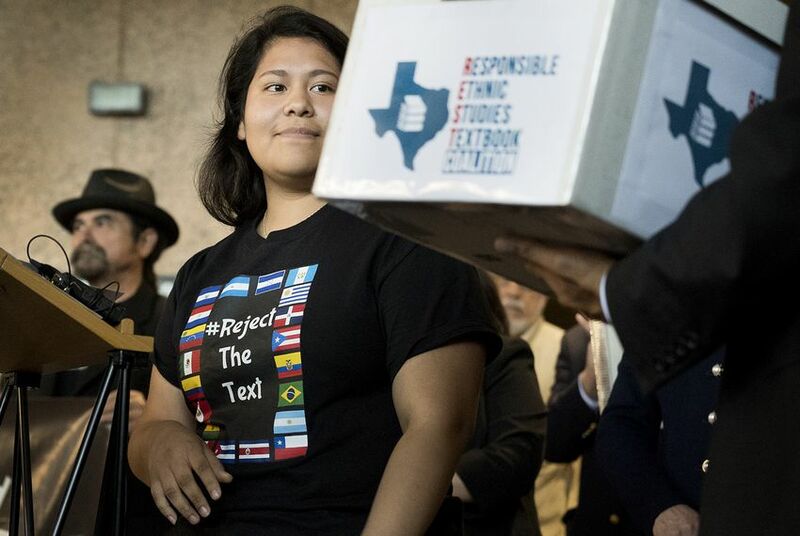 The hearing comes almost two months after the board voted not to approve a Mexican-American studies textbook submission from a local publisher, leaving teachers with no state-approved resources to offer the course. Currently, schools can offer Mexican-American studies as a social studies elective, but teachers and districts must put in additional effort to build a specific course structure and choose materials and they are offering drastically varied versions of the class. With no state-approved standards or textbooks for an official course, smaller districts with fewer resources are facing an uphill battle to get a class started. The board is not scheduled to vote on the matter this week. The board's staff would not be able to start working to create the course until the end of 2018 at the earliest, said Monica Martinez, the Texas Education Agency's associate commissioner of standards and support services. "The only thing we're asking for is to have [state curriculum standards] aligned so everyone can have [information] from the State Board of Education that this is a state-approved course and we have standards to teach them," said Christopher Carmona, a Mexican-American studies professor at the University of Texas Rio Grande Valley. Doug Torres-Edwards, the educator who developed that course for Houston ISD, vouched for the rigor of the standards he created and said they could serve as the foundation for a "bona fide" Mexican-American studies course approved by the state. Some board members pushed back on whether creating a Mexican-American studies course was the right move as opposed to a broader Latino or Hispanic studies course. Board member Marty Rowley, R-Amarillo, said he wondered if creating a Mexican-American studies course would be "ideological" and exclusionary in not focusing on the contributions of "other Latinos to Texas history or American history." Board member Marisa Perez-Diaz, D-San Antonio, retorted that the decision is not a "zero-sum game" and asked why the board could not work to develop both courses. Torres-Edwards said his innovative course's standards could also be used to build a more inclusive Latino studies course, as long as it was structured as a chronological history class. "What I like about Mexican-American studies it that it offers a depth, rigor and complexity that is not truly possible in traditional survey courses," he said.